GhostBed vs GhostBed Luxe - Which Should You Choose? 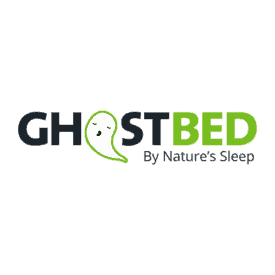 Since its founding in 2015, Ghostbed has been on a mission to bring “supernatural comfort” to sleepers across the United States. But how exactly does it achieve this other-worldy aim? With an arsenal of excellent sleep products led by two powerhouse mattresses: The Ghostbed and Ghostbed Luxe. While I’ve taken a look at both of these beds in the past, today I’m going to be pitting them against one another to see which of these ghoulish models reigns supreme. Could it be the gentle yet buoyant all-foam Ghostbed? Or will its temperature-regulating cooler sister emerge triumphant? Read on to find out! Don’t have time to get tangled up in this haunted free-for-all? Skip to the end of my review for some general recs on how to decide between these beds! Before we dive into what makes these Ghostbed siblings different, I wanted to start off this comparison by figuring out some of their key similarities. By sussing out all the characteristics they share, we can better understand how their distinct modifications inform their individual feels! Cooling – Both the Ghostbed and Ghostbed Luxe are designed with cooling in mind. The former stays cool thanks to a breathable, perforated layer of latex combined with a section of gel-infused memory foam. The latter also features gel memory foam, but amps up the cooling with a special phase change material in the cover. All-foam – The Ghostbed models have seemingly similar all-foam constructions, which some customers might think means they’ll sleep the same. While it’s true that these foam makeups can evoke comparable feels, as you’ll see later on, there are subtle design differences at play that make these mattresses totally unique. Bounce & Pressure Relief – Another similarity you’ll notice between these beds is that they offer a pretty balanced feel between pressure relief and support thanks to the mix of memory foam and the brand’s proprietary Bounce foam. So regardless of the Ghostbed you go with, you’re guaranteed to experience some solid, supportive comfort. Now that we’ve got the similarities out of the way, let’s take a gander at all the features that make these Ghostbeds such distinct mattresses. Some key things to keep an eye on: the order and thickness of their foam layers as well as their different cooling properties. 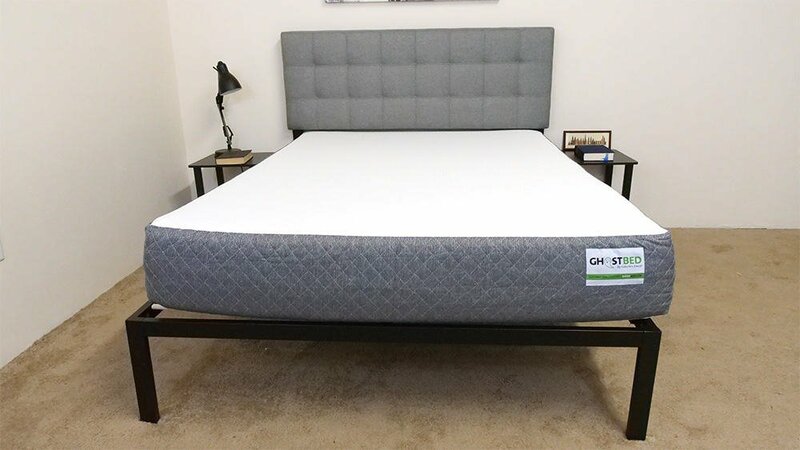 I’m going to walk you through a brief synopsis of each bed’s specific construction below, but would encourage you to also check out our full reviews of the Ghostbed and Ghostbed Luxe. Cover – The cover is made up of a combo of viscose and polyester, which creates a stretchy material that won’t bunch up as you move around in bed. It’s also quite a thin fabric, so will encourage some nice airflow throughout the bed. Comfort Layer – Comprised of 1.5” of latex foam, the comfort layer of this mattress has a quick response to pressure. 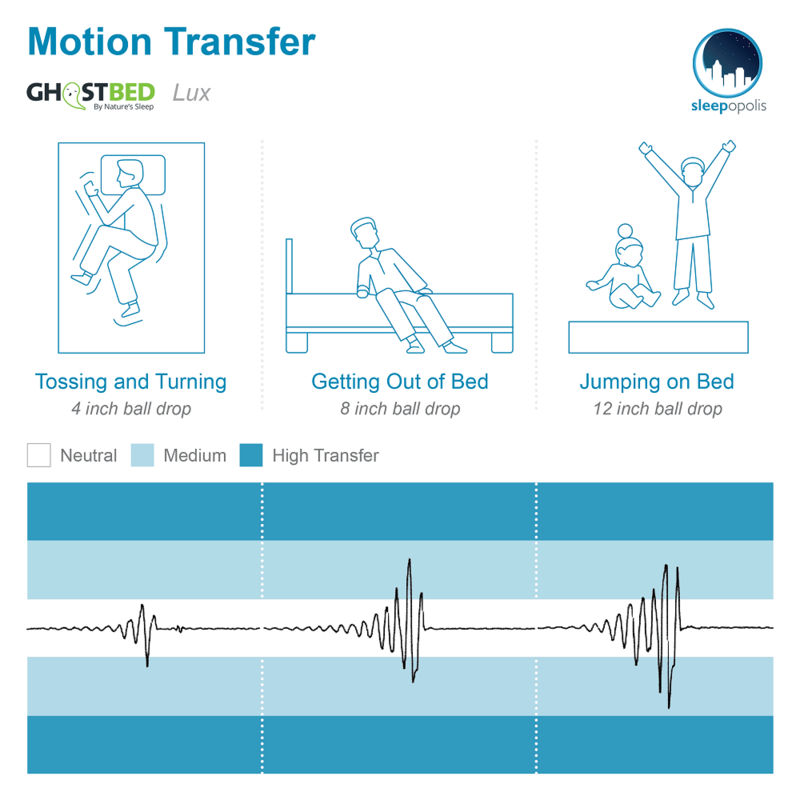 This bounce should help to keep you positioned on top of the bed and will likely prevent you from feeling stuck in the mattress. And since this section is built with latex, it also benefits from the material’s natural cooling properties. Compression Layer – Up next, you’ll find 2” of gel memory foam, which functions as a sort of compression layer in the mattress for deep body contouring and pressure relief. While memory foam has a reputation for overheating, the combination of the gel-infusion with its placement below the naturally cool latex helps to combat this. Base Layer – The foundation of the mattress consists of 7.5” of high-density poly foam, working mainly to provide support to the mattress as well as some durability. Cover – The cover of the Luxe is made from the same viscose/polyester blend of the original Ghostbed, but also incorporates a special phase change material to provide temperature regulation and cooling. It’s smooth and, noticeably, cool to the touch. I should note that the cover is also quilted with an inch of gel memory foam, which provides the sleeper with some immediate comfort and relief. Phase Change Material – There’s an additional layer of phase change material directly beneath the quilted cover that further helps with this temperature regulation. It stretches out over the entire surface area of the top foam section below. Comfort Layer – This first foam section is comprised of 2” of gel memory foam, a soft material that allows the sleeper to sink in for deep contouring and pressure relief. As we discovered with the Ghostbed, the infusion of gel here helps to mitigate the overheating properties of memory foam. 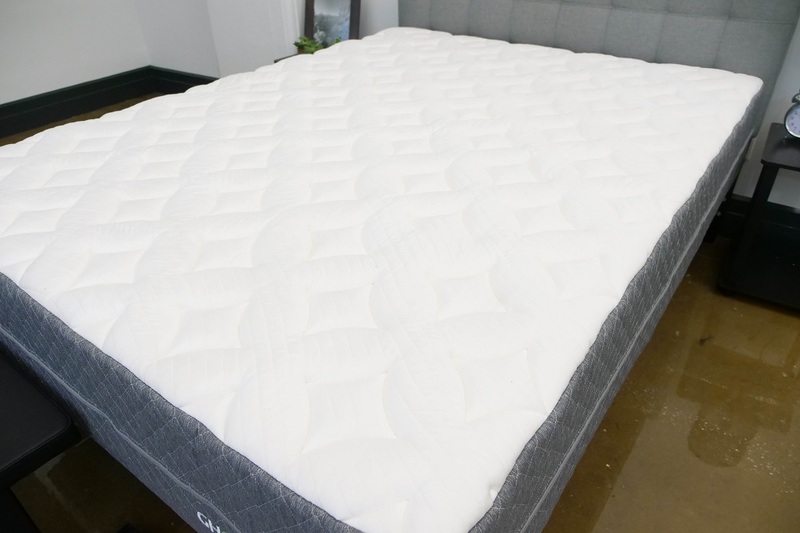 Transition Layer – Unlike in the Ghostbed, the “bouncy” layer—comprised here of 2” of Ghostbed’s proprietary Bounce Foam—is placed after the memory foam and functions mostly to transition the sleeper into the firmer section below. While the placement may not seem like a big deal, ordering the layers this way helps to extend the contouring of the memory foam top layer deeper into the bed, creating a plusher vibe. Base Layer – The foundation of the mattress is built with 7.5” of high-density poly foam and provides support to the layers above it as well as deep compression support to the sleeper. This layer also gives the Luxe its shape and durability. Another thing I noticed is what a difference a simple reordering of layers can make! I briefly touched on this in the construction section above, but the flipping of the memory foam and latex layers in these beds really does shake up their feels. For example, the placement of the Bounce Foam below the gel memory foam in the Luxe makes for a softer vibe that could do wonders for side sleepers. When the layers get flipped in the Ghostbed, we find ourselves with a slightly bouncier structure best suited for those who sleep in multiple positions. Now that we’ve carefully inspected the nitty gritty details of each of these Ghostbed models, let’s get into the real good stuff, namely how these bad boys feel. To help you get a clearer sense of how you’ll likely experience each mattress, I’m going to examine their individual firmnesses, sinkage amounts and motion transfer rates. By combining all of these characteristics together, we should manage to paint a solid picture of each bed. First up, let’s chat about firmness. Since everyone feels firmness differently, I brought in three other folks to help me try out each of these Ghostbed mattresses. Below is the graph showing our combined average firmness ratings for each of the two mattresses. 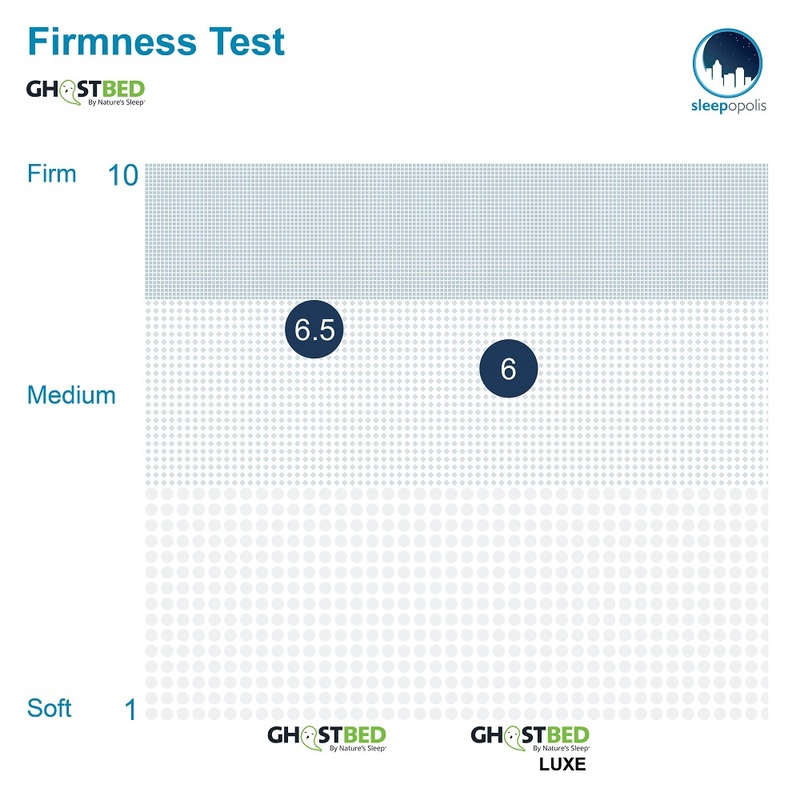 My testers gave the Ghostbed an average firmness rating of 6.5, which perfectly syncs up with the industry standard for medium firmness. I personally gave the bed a 6.5 as I found its combination of memory foam and latex to create a nice balance between pressure relief and support. While you’ll probably experience some sinkage through the top foam layers, you’re not likely to feel stuck in the mattress and should find it easy to move around. In this vein, I found a lot of comfort across positions, which tells me this could be a great pick for combo sleepers. As far as edge support is concerned, I experienced some pretty deep compression through the top foam layers as I scooted closer to the side. This is to be expected from an all-foam mattress like this, but is something to note for those who need to feel uniformly strong support across the entire surface area. In answer to my hypothesis that the Ghostbed Luxe would have a plusher feel, my testers gave it an average firmness rating of around 5.9. I personally gave it a 5.5, finding it to be a fairly soft bed. While you do get a bit of bounce from the transition layer of latex foam, the inclusion of memory foam in both the cover and comfort layer really affects the overall feel, resulting in some deep contouring. That being said, I’d recommend the Luxe for side sleepers as they tend to prefer softer beds that cushion their shoulders and hips. Though this softness should translate to some pretty weak edge support, I was surprised at how well the Luxe held up when I stretched out close to the side. True, there was the same kind of compression I noticed in the Ghostbed, but overall, I felt more supported. What’s striking about these results to me is that they show the original Ghostbed exhibiting slightly deeper sinkage than the Ghostbed Luxe. After stretching out on both of these mattresses, I would’ve assumed the opposite to be true, as I found the Luxe to have an overall plusher, laying-in-the-bed feel than the Ghostbed. I think this is an important thing to point out because while I love me some good ol’ sleep data, sometimes personal experience is going to trump what measurements can provide. As you can clearly see in the graphics above, the Ghostbed Luxe has much better motion transfer than the Ghostbed. This mostly has to do with the fact that it has more memory foam than the original, which helps to absorb and dampen motion over the entire surface area. For this reason, I’d suggest that couples go for the Luxe over the Ghostbed as it’s going to be better at containing disturbance. After taking a closer look at all these different feel components, the impression I’m left with is that the Luxe is essentially a more luxe-urious version of the Ghostbed (a trend I also noticed in both my Purple and Tuft & Needle comparisons). It’s got more memory foam, a silky smooth cover and enough contouring to leave even the tensest of sleepers feeling like they’re dreaming on a cloud. 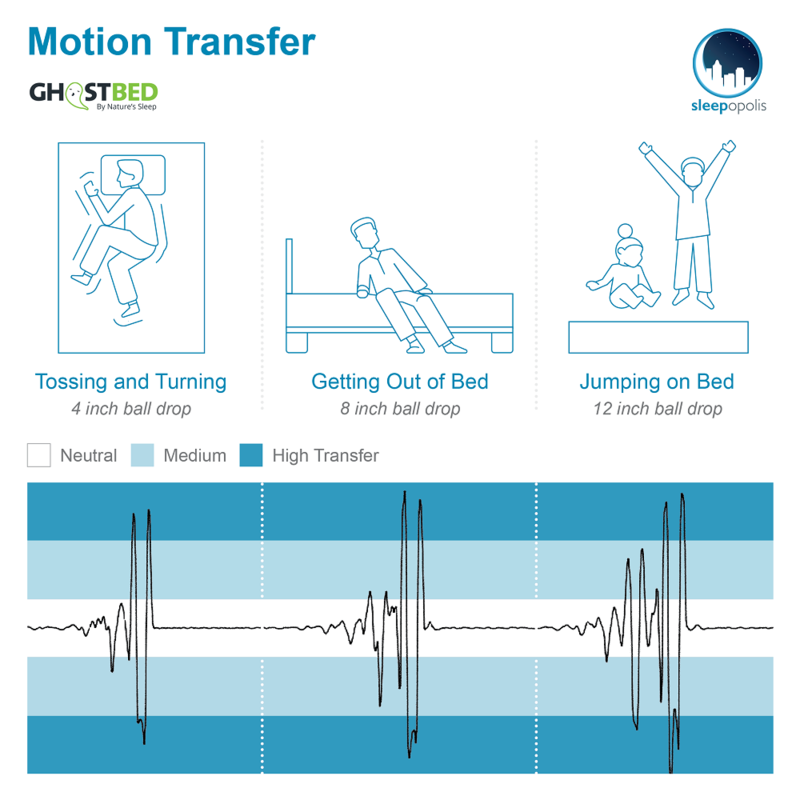 It’s also got better motion transfer and edge support results, which could be important for those of you planning to share your bed with a partner. For all these beefed up modifications, there is a bit of a price difference to grapple with here as a Queen size Luxe retails for $1,475 — nearly double the price of the original ($795). All this being said, this doesn’t necessarily mean that the Luxe is going to be the perfect bed for everyone. A lot of people will likely prefer the “simpler” construction of the original Ghostbed as well as its bounce and firmer support. The first thing to figure out is what kind of feel you’re after. If you’re in the market for a plush, memory foam vibe, you can’t go wrong with the Luxe. 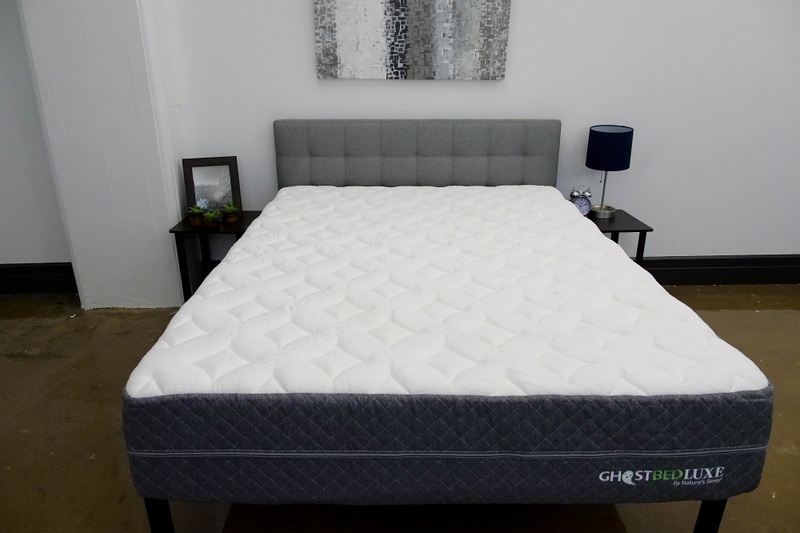 However, if you want a more subtle foam feel that’ll allow you to change positions with ease, then I’d suggest checking out the original Ghostbed. 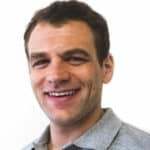 The second comes down to whether or not you’ll be sharing your bed with a partner. With its impressive motion transfer and edge support results, I’d say the Ghostbed Luxe would make the better mattress for couples. 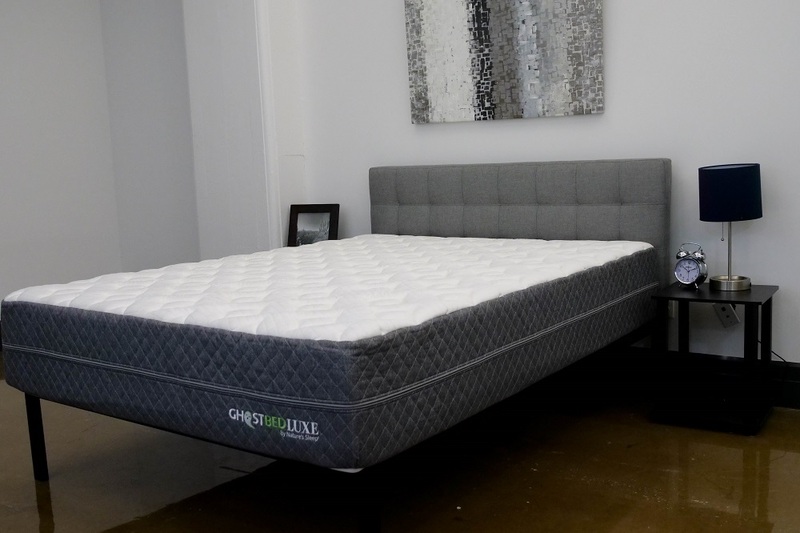 Both the Ghostbed and Ghostbed Luxe are extremely durable mattresses, which could be a great thing for those looking to invest in a structure that’s going to last for years to come. These two mattresses also offer pretty fantastic pressure relief. Their mixed foam constructions cushion the curves of the body in a satisfying way, bringing the sleeper immediate comfort. And finally, these Ghostbed siblings also sleep cool. Whether achieved through the phase change cover in the Luxe or in the gel-infused memory foam of the Ghostbed, this cooling could be perfect for those who tend to overheat in the night. 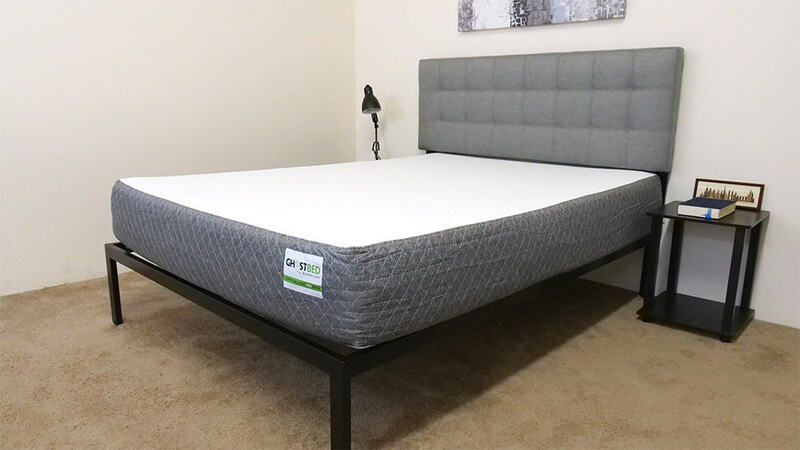 With its pleasant, balanced foam feel, the original Ghostbed is super well-suited for combo sleepers, or those who doze in multiple positions throughout the night. It could also make an awesome pick for anyone on a budget, as its Queen runs at just $795, which is a great deal when compared to similar beds on the market. As I mentioned above, both Ghostbed models sleep cool, but the phase change cover of the Luxe gives it a slight edge in this category. Not only does it sleep cool, but it’s literally cool to the touch, a nice feature that could be a big selling point for the right sleeper. And while both beds are fairly gentle, the Luxe certainly has more of a plush vibe, making it an excellent choice for side sleepers or those in need of even deeper cushiony relief. If you’re looking for more of a traditional innerspring feel, these beds may not be the ones for you as their all-foam constructions make for a softer vibe. In that same vein, if you’re not a fan of sinking into your bed, the Ghostbed mattresses probably won’t work for you. Well that about does it for this Ghostbed matchup! If you have any specific questions or want a personal bed recommendation, make sure to leave a comment on our YouTube video. 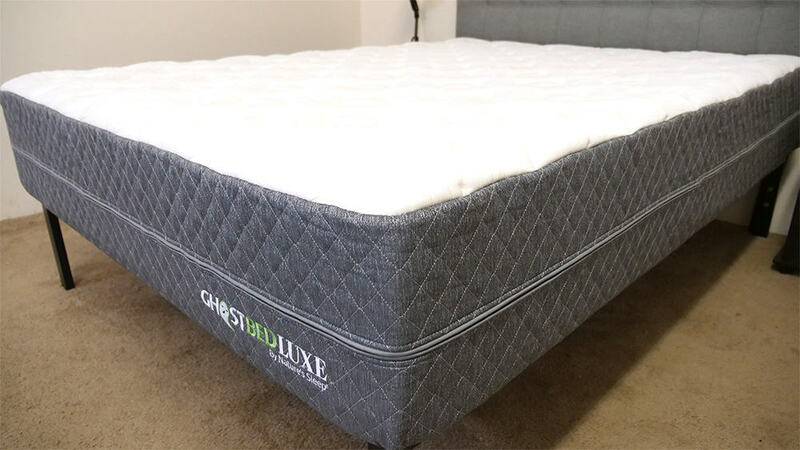 If you’re ready to make your purchase click here to buy your GhostBed or GhostBed Luxe direct from the company!